Have you even been pulling your travel trailer or fifth wheel and signaled to make a lane change and the guy next to you just doesn't seem to get the message. You watch your mirror, waiting for him to take some kind of action that will allow you to move over but he just hangs there next to your trailer. It's bad enough when it happens out on the highway, but when you're in urban traffic trying to maneuver 50 feet of rig for an upcoming turn or lane merge it can get frustrating really fast. Think about it, if a motorist is just forward of the end of your trailer, there's a good chance he can't see your rear lights and it's possible the turn signal light on your truck is obscured by the front corner of your trailer. On our old Prowler fifth wheel the back of the truck was very close to the front of the trailer and the truck tail lights were hard to see from the back of the trailer. 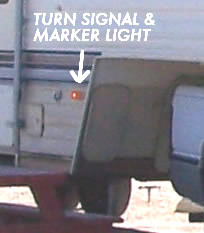 My solution was to mount a pair of combination signal/marker lights at the front corner of the fifth wheel. I really feel that extra signal lights help to make my intention to change lanes apparent to motorists and at night the marker lights help out as well. When we got our new Coachmen Chaparral fifth wheel one of the first modifications I did was to add an extra pair of signal/marker lights. And, on the theory that more is better I added two more signal lights to each side. The red marker light was already there so I placed the amber turn signal light just in front of it. The middle turn signal is just in front of the wheels. The light up by the door is an orginal marker light. The front marker/turn signal light is hard to see in the large photo so I included the inset. Installing the lights along the skirt of the trailer was as easy as anyone could hope for. The skirting is totally cosmetic and the underside is completely open. I tapped into the wiring for the tail lights for the rear and middle turn signals. For the front turn signal/marker lights I tapped into the junction box for the umbilical cord. The wiring for the lights runs along the main frame members under the trailer so I wanted to make sure it was well insulated and weather proof. I went to the local builders store and purchased a 100ft 14 gauge outdoor extension cord. It was plenty long enough, durable, had the three conductors I needed. It cost about $12. There are plenty of different connectors I could have used but I'm a little 'old school' so I just soldered and taped the connections.